Our Basswood plantation shutters in Melbourne are made from a timber sourced from trees of the tilia family. Known for their strong trunks, the timber is unlikely to bleed excess resin that could otherwise affect the finish of the timber during staining and painting. The natural wood of the basswood shutter will not warp or fade over time. They also have a resistance to both heat and water, which means they are fine for use in areas such as the bathroom and kitchen. Because the timber is non-porous, they are also extremely durable. Available in differing blade sizes, we can custom design a profile that is perfect for what you need. Basswood shutters can be made in the following configurations, bi-fold, sliding and hinged joints, allowing them to be used with most window and door spaces. Simple adjustment of the blades allow you to fully control not only the light that enters your home, but also the heat. Basswood shutters are a great insulator, and when adjusted can keep your home warm in the winter, and well ventilated in the summer. 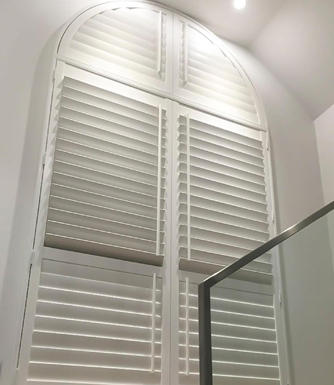 Versatile, strong and attractive, our Basswood Shutters in Melbourne are a great choice.